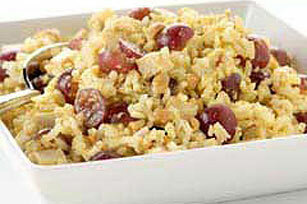 After the big dinner with cranberry sauce and all the trimmings, turkey takes another star turn in this curried rice salad. Combine dressings and curry powder in large bowl. Refrigerate at least 30 minutes or until ready to serve. Garnish with fresh cilantro, if desired. Salad can be stored in refrigerator up to 2 days.